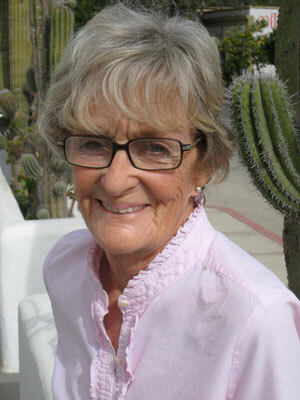 When Catherine Wall was contemplating her retirement, after years of practicing clinical psychology, she decided to explore Baja California. She had a dream of being able to spend more time doing her art, once her four children were grown. 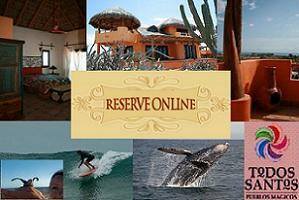 While investigating the Cabo area, she stumbled on Todos Santos. Although Catherine wasn’t convinced Todos Santos looked like a fun place to settle alone, she never forgot it, and decided to return to rent a beach casita to try it for 6 weeks. She walked by a small house on the main drag, and right there decided to take it and open her own art gallery. That was 11 years ago. That house is currently the popular Cafelix. Catherine has since built a fabulous art studio/gallery behind her home a few blocks away, where he shows her work to her many loyal as well as new collectors. Self described as a cross between Grandma Moses and the Impressionists, Catherine’s subjects have ranged from Mexican women in traditional attire, plants and flowers, saints, and scenes. 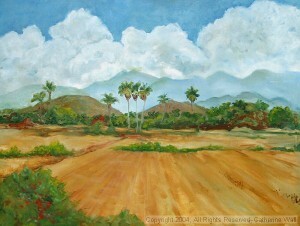 She recently completed a work depicting a mass that the local Padre held at Punto Lobos. When asked if there was anything she hasn’t painted yet, but would like to…her answer was chickens and roosters. Catherine’s wit and self-deprecating sense of humor endear her to everyone who meets her. I asked her if she would like to share a bit of wisdom with our readers, and after a moment, shared two gems….”Freud said it isn’t enough to leave Egypt…you have to make the journey to the Promised Land.” And “ Your heart is where your treasure is.” We look forward to seeing those chickens and roosters someday, painted by one of Todos Santos’s own treasures, Catherine Wall.